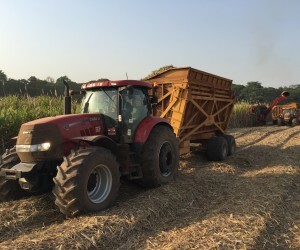 Case IH is brand of choice for leading agro-food company SOMDIAA’s sugar cane plantations and supplies twelve PUMA 225 CVT tractors and one Austoft 8800 Sugar Cane Harvester. Contributing to 70% of the employment in Africa, the agricultural sector is the biggest employment creator in the continent and the main wealth provider in most of the African countries. SOMDIAA is one of the leading players in the agro-food sector in Africa. It mainly produces and markets sugar and flour products but also eggs and animal feed, in Africa and for Africa. Its corporate headquarters are located in Paris but all its operations (crop farming, livestock farming, production, distribution and marketing) are in Central Africa, West Africa and in the Indian Ocean region. The Group mainly employs the local population and sells commodities from the production countries exclusively, thus contributing to the increase in the food self-sufficiency of the countries in which it operates. SOMDIAA produces and markets various types of sugar in Africa for consumers and agro-industrial businesses. Its expertise stretches from sugar cane farming all the way to sugar distribution and industrial transformation. The company produces a total of 350,000 tons of sugar every year. It is constantly striving to develop new methods for cultivation and harvest, and invests heavily in new technologies applied to agriculture. SOMDIAA chose the red livery of CASE IH for its subsidiary Sosucam (Societé Sucrière de Cameroun) and its sugar cane plantations. The twelve PUMA 225 CVT tractors and the Austoft 8800 Sugar Cane Harvester it purchased are presently working in Sosucam’s Sugar Cane plantations in Nkoteng, Cameroon. ”The Austoft 8800 Sugar Cane Harvester has all the technical requirements to meet our new farming system project with dual rows, controlled traffic, yield measurements and losses reduction”, the Director added. Also the productivity and the quality of the harvest are very much appreciated at Sosucam’s, along with the maestro control and the AutoTracker, which really impressed operators. The exclusive, factory-fitted AutoTracker helps to minimise cane losses. Cane stalks are cut at ground level, and the base cutter height is either controlled by the operator or automatically by the AutoTracker which consists of two rotating discs with 5 blades each. The cutter angle can be adjusted from 12.5º to 17.5º. On average, the AutoTracker reduces stool damage by 27.2%, root ripping at the end of rows by 28.3%, and the overall cane losses by an impressive 62.9%. At Sosucam’s, the PUMA tractors, equipped with GPS guidance (RTK), carry out different tasks that go from land preparation to infield transport and harvesting. 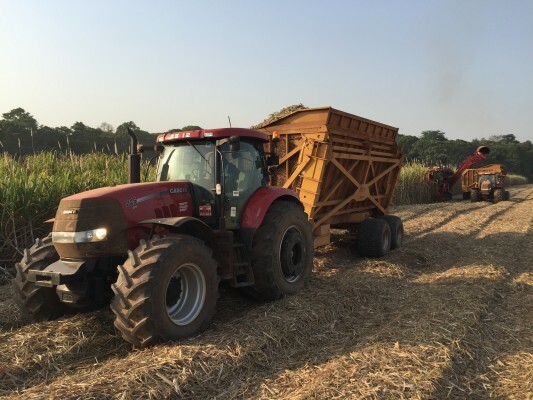 According to Eren Oğuzoğlu, Business Manager Case IH Africa, there are some key features of the Puma tractors and the Austoft sugar cane harvesters that meet the specific needs of farmers in Cameroon. “For instance, with the Austoft 8800 and its advanced features, it is possible to highlight the efficiencies that can be gained in the field in a very detailed way,” says Mr. Oğuzoğlu. “One can know if one machine spends more time unloading than others or identify those machines that unload more while moving. This can save Sosucam harvesting hours,” concludes Mr. Oğuzoğlu. CASE IH’s Business Director also underlines the advantages of the Puma 225 CVT. This reliable and durable tractor always maintains the ratio of the mechanical drive very high to maximize efficiency thanks to its 4-speed transmission. And about the Sugar Cane Harvester he highlights the high capacity and the performance of the equipment, as well as the comfort in the cab that makes working long hours easier considering that these machines harvest 28 to 48 tonnes/hour. Last but not least, at Sosucam they underline also the importance of the outstanding after-sales service they have had since they received the new equipment. Exceeding customers' expectations in terms of productivity and profitability and supporting them with innovative products and excellent services is CASE IH’s mission. In Africa, in the world.